Crossing SFO with planes flying overhead? Passing by a huge container crane? Three large Navy ships? San Francisco Giants baseball park? Yeah, that's exciting for a SUP trip. Coyote Point to Mission Creek has several put-in and take-outs in between so you can take your pick of the distance between 10 miles as well. Summer downwinders are great with the west wind carrying you down south and winter downwinders with south wind carrying you north. 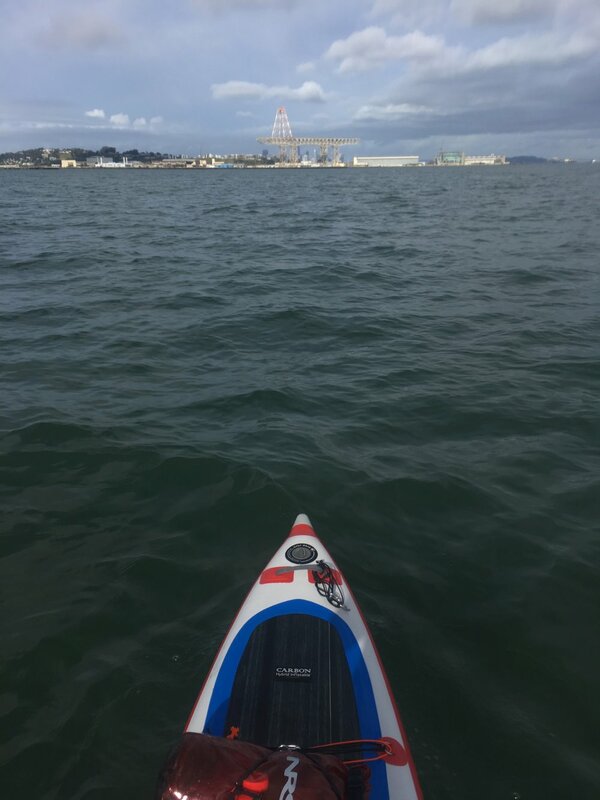 On January 8th, 2017, I paddled from Redwood City to Mission Creek under really favorable conditions. The storm had stopped and I had an opening with slight south wind. The 10 miles was pretty easy to cover under 3 hours. You have to be careful with SFO and stay wide and clear otherwise the police/coast guards might chase you out of there. The current around Hunter's Point could be tricky sometimes and certainly watch out for bridge traffic before AT&T park. 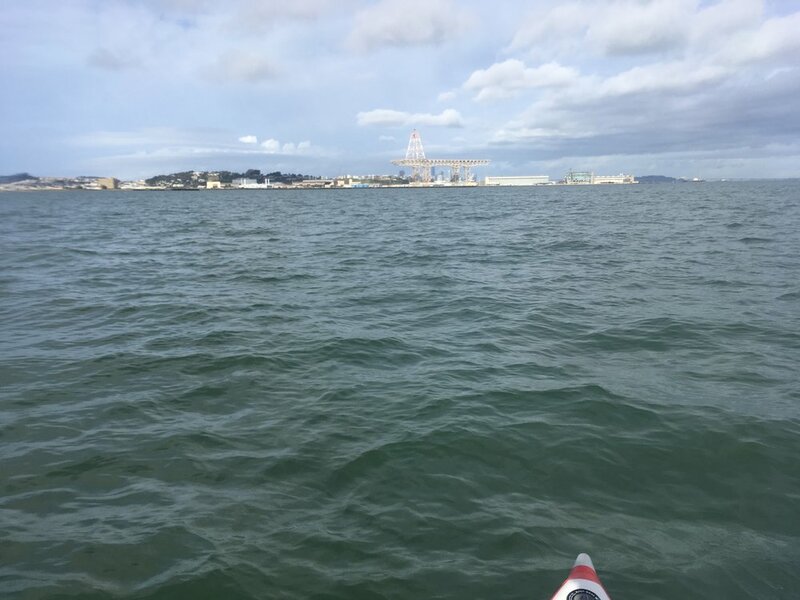 The Navy ships that are parked before Mission Creek can be death traps if you paddle between the ships or even close to them during strong current and wind. There are many tug boats that are docked on this stretch and depending on the captain you can have a very different experience even though SUPs have the right-away. Last but not least, sometimes the NW winds during the summer might push you towards East Bay, you'll have to fight your way to stay along the coast. 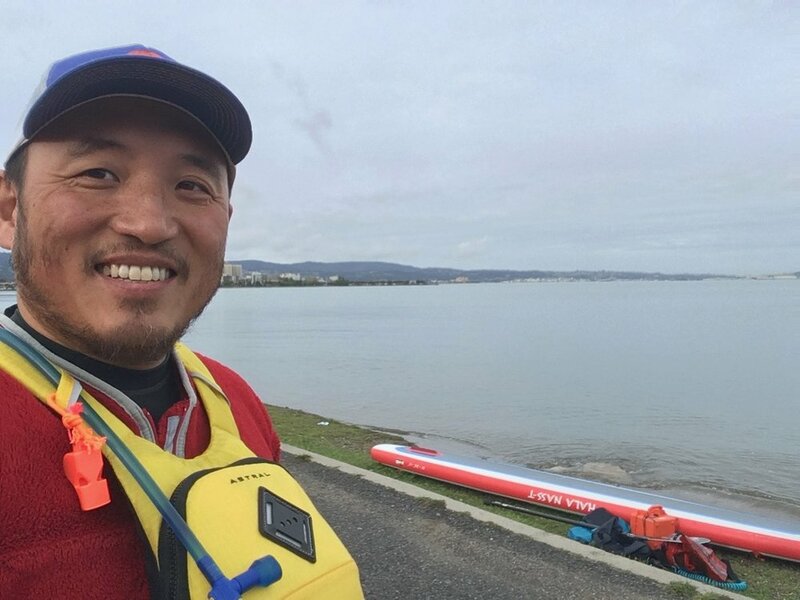 Put-in: Coyote Point Beach is a perfect take-out for various small boats. There's Boardsports California which rents and sell both wind/kitesurf boards and SUPs. Be aware of GPS confusion, there's a Coyote Hills park in Fremont. Some of our shuttle drivers were reporting that google maps were leading them there instead. Inside of the Coyote Point Recreation Area, there are two parts also - the marina and the beach. Make sure you direct your driver to the beach. Take-out: Mission Creek or Mission Bay has several places where you can land. The Ramp (the restaurant) is a great place to land and have lunch. There's a public ramp at Bay View Boat Club which is nice (no bathroom), but you'll need to read the parking signs carefully due to the Giants schedule. Another great ramp is at the end of Mission Creek along Berry Street. There's a public bathroom there and also a boat house that belongs to UCSF. Parking is sparse though. On top of that, there's plans for the Warriors to move their stadium over to Mission Bay in the near future, so definitely forget about parking when that happens.